As one of San Francisco’s leading dentists, Dr. Samir Ayoub has worked on complex cases requiring the restoration of all of the teeth in the upper and lower jaws. This type of treatment is known as full mouth reconstruction. Comprehensive full mouth reconstruction cases involve a combination of multiple restorative and general dentistry treatments. Though time-intensive, full mouth reconstruction yields incredibly rewarding results. By rebuilding all of the teeth, patients can enjoy the look, feel and function of natural, healthy teeth. The first step toward rebuilding your teeth and smile is to see Dr. Ayoub for a consultation. During your appointment, Dr. Ayoub needs to get a better sense of the condition of your teeth, gums and, in certain cases, the temporomandibular joint (TMJ). After assessing the extent of the problem and acquiring information from X-rays and photographs, he will suggest a step-by-step treatment plan customized to your specific needs. Placement of dental implants: Implants replace an entire tooth, root to crown. A titanium post is surgically placed in the jawbone to serve as the tooth root; after integrating with the bone, it is topped with an artificial tooth. Implants can support an individual crown, or they can be used to anchor dental bridges or even denture appliances. Placement of dental crowns: Crowns provide strength and support to weak or damaged teeth. These small restorations are placed over the tooth and restore the look and feel of a natural tooth. Bridgework: Dental bridges close the gap left by a missing tooth. These restorations require at least two remaining natural teeth to affix to. If you do not have any teeth remaining in the mouth, bridges will not work. 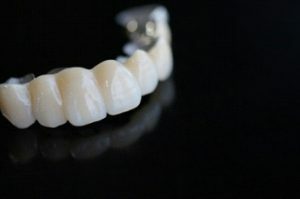 Dentures: These dental appliances restore an entire arch of teeth in the upper jaw, lower jaw or both. Gum recontouring: Removing excess gum tissue can help create balance and harmony in the smile. Dental fillings: Fillings are placed to restore teeth that have sustained significant decay. Tooth-colored fillings are the esthetically superior choice, as they match the shade of natural teeth. Orthodontics: These tooth-straightening appliances shift the teeth into the optimal position for reconstruction. Surgery to reposition the jaw: If the bite is off, the jaw may need to be adjusted, through either surgery or an orthotic-like device. 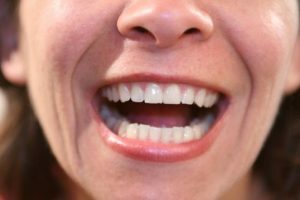 Full mouth reconstruction is often confused with a smile makeover. Both treatments involve a combination of procedures, but the goals are different. Smile makeover is an elective procedure performed strictly for cosmetic purposes, whereas full mouth reconstruction is necessary to restore full dental function. To learn more about full mouth reconstruction with Dr. Samir Ayoub, please contact our San Francisco dentistry practice. You can reach us by calling (415) 781-2227 today.